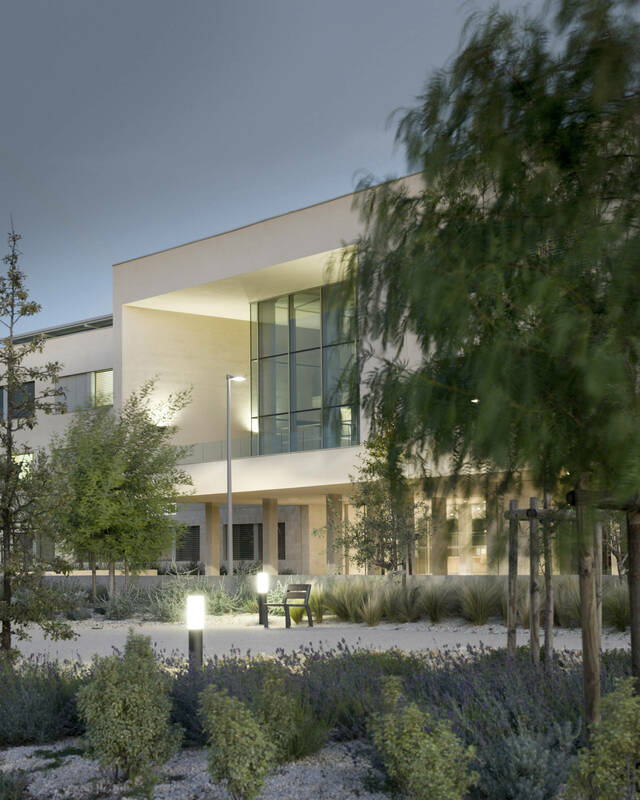 Built at the edge of the village, overlooking a terraced garden planted with local trees, this hospital boldly asserts its identity, which is both singular and contextual. A large recessed loggia forms a balcony overlooking the surrounding scrubland, highlighting the main entrance and giving it a hospitable feel. Two main axes give the building its overall structure, which is clear and accessible: on the north-south axis, leading from the entrance, an indoor street connects the main common areas and treatment areas to the patient rooms; along the east-west axis, a “gap” opens up the building to the surrounding landscape, creating an interior courtyard with planted steps; this provides visual relief and brightens up the work areas that open onto the interior landscape. Inside, the omnipresence of natural light, framed views of the countryside, and a calming, welcoming atmosphere all make for remarkable levels of comfort. Construction of a care and reeducation center "L'Egregore", in Caveirac, in the suburbs of Nîmes (30).